"The New Generation of Brilliance"
In 2004 Swarovski released their copyrighted XILION cut - a new and unique cut that optimises the light reflection of Roses and Chatons. Rose are loose crystal components with flat backs. Chatons have a coned diamont-cut. The XILION cut results in intense brilliance and luminosity. 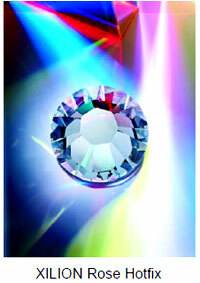 It is the XILION cut that makes XILIION items stand out from other Swarovski crystals. It has alternating facets of different sizes. And its specially designed table face produce perfect light refraction and especially intense light distribution. In contrast to a Rose with regular cuts, the points of light in a XILION Rose are particularly intense. Swarovski guarantees exclusivity for the XILION Rose (crystal with flat backs). 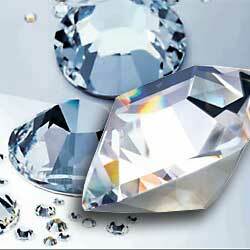 So Swarovski customers can rest assured that their Swarovski XILION cut crystals are of unparalled brilliance. Together with the unique cut, it also benefits from quality foiling and their new adhesion technology. In early 2012, during their Innovations Spring/Summer 2013, Swarovski lauched their improved and upgraded XILION Rose 2038. This completely replaces the former 2028, which was released in 2004. This new generation of Hotfix is on XILION Rose (flat back), Chatons, Transfers, and on the flexible Crystal Mesh. "Hotfix" is the glue on the back of Flat Back crystals. This highly flexible glue is activated at temperatures between 120 and 170°C and bonds with the carrier material. As the glue cools, the crystal components are securely and permanently fixed to the carrier material. "Hotfix Transparent" is the Swarovski Hotfix glue with a patented, transparent primer. The use of "Hotfix Transparent" with non-mirror-coated Flat Back crystals produces an innovative 'raindrop effect', as the crystals take on the colour of the carrier material.